Aha! Finally I'm here with this. 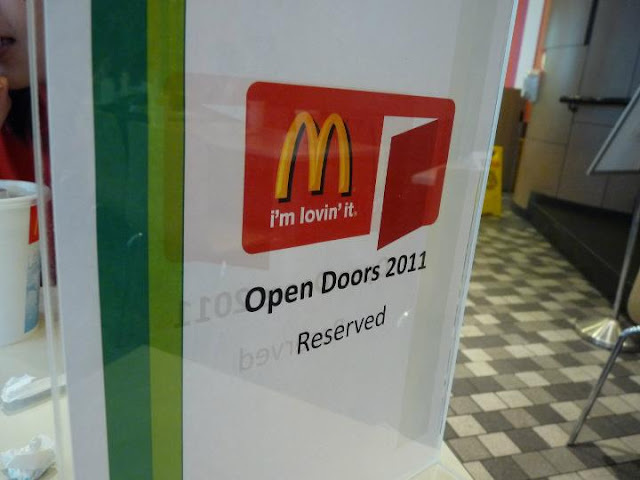 Yes, the McDonald's Open Doors Tour is back! 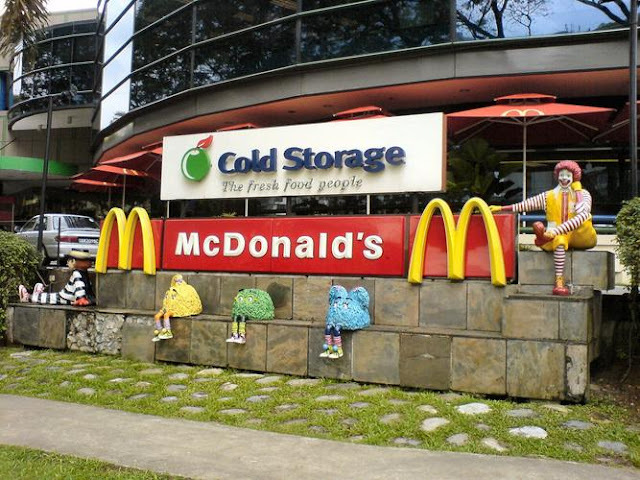 If you're lost, the tour was once open to the public for you to better understand how McDonald's function, and of course, to dispel all the untruths you may have heard about the "evils" of this fast food giant. Fond memories of this place - King Albert Park McDonald's. Being a Bt. Timah school student (I used to be from Nanyang Girls' High and Hwachong), how could I not have been here? After school or after school events like Sports' Day and MAF , this would be THE place to hang out and meet new friends. From where else, Chinese High la~~~ LOL!!! I belong to Team A! Because it was such a huge group (about 30 people), we had to be divided into 2 groups for the tour. P.s. Usually the tour would only take about 10 person each time! Before this tour, I have to admit that I always had doubts about McDonald's foods. Like, how the beef patties are mostly fillers, and their fries being really unhealthy though I love it so much. The very first thing that greeted me - everybody's favourite thing on the McDonald's menu!!!! Their fries contain no gluten, wheat, or beef extract flavouring, so what you taste is really just the fries, and the salt (or without if you like!). What's more, the oil used for frying the fries are automatically changed by their filter system (either that or the staff will change the oil manually). So you can be sure that the oil is not used the WHOLE day or overnight~ No wonder the 11am fries taste the same way as fries you'd get during midnight~ Yum!!!! This is the grilling machine for their meat patties. Unlike the McDonald's game that some of us have played (you do know there is such a game? ), McDonald's uses NO ADDITIVES, FILLERS NOR BINDERS for their beef! Only 100% beef. And no oil is added. Just a dash of salt and pepper to bring out its natural, juicy flavour. 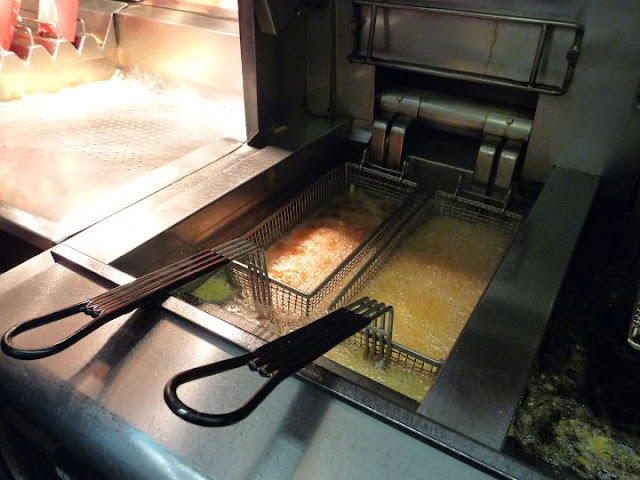 Plus they work only with parties known to abide by the strictest food safety and quality standards in the industry. As for their chicken? Ah~ They use only choice cuts from whole-muscle chicken including boneless breast fillet and thigh. And they make sure their chicken comes only from rigorously-inspected sources approved by the AVA, with strictly NO fillers. The same goes for their nuggets - only 100% white chicken meat! This is the warmer. Food that has been cooked can only be kept for a certain period of time before they are disposed. In each of these labelled warming compartments are the patties, and each kind of patty has their own freshness time limit. Under this "Medium" sign are food which are not as frequently ordered. There will always be a High, Medium or Low sign to indicate how customer order flow is like, so as to prevent making of excess food and thus leading to wastage. Little reminders around the kitchen to help the staff adhere to strict quality control. To ensure no wastage, based on experience, these are the numbers of pancakes to make at each hour. We can see from this chart that between 7-9am, the orders for Pancakes are the highest! I almost forgot how it felt to wake up so early for McDonald's breakfast! NICE!!! Use what paper to wrap which burger? Got sticker not? This the Bacon and Egg McGriddle wrapper! Then at the bottom is my favourite Egg McMuffin's wrapper! The Egg McMuffin bun! As well as the Big Breakfast bun. I love these on their own. Yup, without the grape jam. YUM!!!!! I believe this is for the egg in Egg McMuffin! OMG the Fillet-O-Fish bread!!!!! My primary school teacher brought me to the factory that supplies these Filet-O-Fish breads to McDonald's, and I FELL IN LOVE with the breads! Especially when they are fresh out of the oven....the staff have to be careful not to press on the top or there will be fingerprints. Not easy to handle. Fillets of fish for the Filet-O-Fish™! McDonald's only uses prime white fish caught from the depths of the Atlantic and Pacific Oceans. Hoki and Alaska Pollock, to be exact. =) While still out at sea, their suppliers use a unique quick-freeze process to seal in the ocean-fresh quality. The fish is then filleted on shore by the fish experts, then frozen, blocked and formed into patties. To ensure proper hygiene, blue gloves are used for uncooked/raw food whilst white gloves are meant for handling cooked food. This is to prevent contamination of bacteria from the raw food onto the cooked food. And we head to the McDonald's freezer. McDonald's freezers can be opened from the inside la! -.-"
Doubt you can get trapped inside even if you wanted to. So what's kept inside? The perishables of course. OH MY GAWD!!! *weak in the knees* Cinnamon Melts!!!! Need I say more? I'm not exactly someone with a sweet tooth, but I tried it once and was impressed. Okay I admit - I have no idea what these Frozen Eggs are used for. McDonald's eggs are freshly cracked and cooked with every McMuffin and Big Breakfast order. And the eggs are washed and sanitised to remove all signs of dirt from the shells, then oiled to seal in freshness of product and to ensure optimum food hygiene. Fries, Chicken and Beef Patties. APPLE PIES!!! I WANT A BOX OF THOSE!!!!! When cooked, how could anyone resist these??? And then we get herded into the warehouse. There's our tour guide explaining to us their concept of storage of food items- First In, First Out. Whatever comes first gets used up first. This is to ensure freshness of course! Who's a fan of this? The Garlic Chilli. Not me. I miss the plain ol' spicy non-garlic chilli sauce that McDonald's once had. Can it come back please? Let us have a choice? The garlic chilli was back by popular demand but the normal chilli could have stayed? Dehydrated onions? I didn't know such a thing existed! Cheese for the new Cheese Shaker Fries! OMG I'm in love with these! If you've not tried it, you're losing out MAJOR! Tell u why later!!! The crew pantry/relax corner. This is where crew find out the latest updates that's happening in the company or the branch, and where they relax and have their meals. Nicely decorated with bright and cheery colours to up crew morale! Me likey! Every company should have this chart! Want to work at McDonald's anyone? After the tour, McDonald's at KAP spoilt us silly by giving us a continuous flow of food items from their menu! How many of you are fans of the snack Super Rings!???? The McDonald's fries, coupled with the cheese shaker seasoning, tastes EXACTLY like the Super Rings!!!! Except that it's warm and fresh and crisp and may I say, BETTER!!! So if you like the orange doughnut-y snacks, try the cheese fries!!!!!! Us enjoying the hospitality bestowed upon us by the friendly fast food giant. Oh yes, as quoted by her in Chrispytinetoo.blogspot.com, "together with Silver, we wolfed down 2 box of nuggets, 1 box of Mcwing, 2 cup corn, 1 M size french fries, 1 Horlick McFlurry, 1 Cinnamon Melt, 1 Fillet O Fish & Big Mac." She's not kidding. And in case you're wondering how we manage to remain slim (I keep insisting I am not but so many of you say I am so fine I am slim, just not magazine-material enough. ), the trick is just to have a sharp heart-shaped face. No la! I don't eat like that every day! I went home feeling super stuffed and had to prevent myself from bending over the toilet to gorge food out of my oesophagus. My companion and great-to-talk-to friend, Row. Love her to bits! Don't know why. I think they call it "affinity". Anyways, 5000 people in Singspore have already gone for the tour since 2009, it's time you register for yours. Find out and see for yourself the honest truths about McDonald's food, and how it's really a whole lot of goodness and responsible marketing. Conducted between 18 September 2011 - 19 February 2012, in 25 restaurants world-wide, the Open Doors tours will take place every 3rd Sunday of the month. Register for the next one on the 15th October at www.mcdonalds.com.sg/opendoors now! Invite: Skydiving @ iFly Sentosa!! !